Mrs. Dunwell, of 23, Walverden-road, Briercliffe, has received the sad news that her husband, Gunner Harry Dunwell, of the R.G.A., died of dysentery at Alexandria on November 12. Gunner Dunwell joined up in July 1916 and after training at Southampton was sent out to Salonika the following January 1st. He was later sent to Palestine, and his wife had recently received letters from him saying he was in good health. Private Dunwell’s name figures on the Roll of honour both at Hill Lane Baptist Chapel, with which place he was associated as a lad, and at St james Church. It is rather a strange coincidence that he and Private Whittaker, residing next door to each other, should have died on the same day, November 12th. 1919 – DUNWELL Harry of 23 Walverton road, Briercliffe near Burnley, gunner R.G.A. 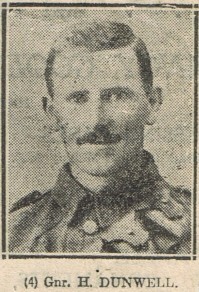 died 12 November 1918 at Alexandria in Egypt. Probate London 27 January to Annie Dunwell, widow. Effects £399 10s. 1d. Thomas Dunwell, Head, M, 46, Coachman Domestic, b.Yorks, Thirsk Hammerton.